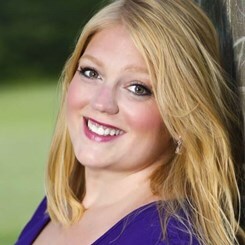 Hope Krick-Osborn, Soprano, graduated with a Masters Degree in Vocal Performance and Vocal Pedagogy from Westminster Choir College of Rider University. Hope has been seen in many operatic roles such as Mimi in La Boheme, Arabella in Arabella, Marshalin in Der Rosenkavalier, Donna Elvira and Donna Anna in Don Giovanni, Suor Angelica in Suor Angelica, Tessa in The Gondoliers, Josephine in H.M.S. Pinafore to name a few. Hope made her professional operatic debut with the Delaware Valley Opera Company singing the role of Donna Anna in Don Giovanni. Hope has participated in the prestigious CoOperative Program for two years, participated in the Florence Voice Seminar in Florence, Italy and has performed over 40 recitals throughout the United States. Some of Hope’s solo concert experience includes Mahler’s 2nd Symphony, Mozart’s Requiem, Vivaldi’s Gloria, The Rutter Requiem, Rachmaninoff’s Vespers, Mozart’s Vesperae solennes de confessore, Faure’s Requiem, Mozart’s Requiem, Haydn's Little Organ Mass, Ray’s Gospel Mass, and the NJ/DE/ PA premier of the Jenkin’s Stabat Mater. Hope traveled throughout Ireland and Italy and was a part of the first American Choir to perform in the Sistine Chapel. She has been a soloist at Lincoln Center, New Jersey Performing Arts Center, and New Jersey State Theater to name a few. Among many prestigious awards, Hope has been awarded the Milton Cross Award from the Continuo Arts Foundation and has twice been awarded the Encouragement Award from the Metropolitan Opera National Council Auditions. Other awards include having been awarded a grant from the Wagner Society of New York. Princeton based, she has performed with the Princeton Amateur Society, Princeton Friends of Opera, Kinnara Ensemble and the Princeton Festival at McCarter Theater. Hope’s discography includes being a featured soloist on Angels and Architechture: The voices of Anam Cara and Teaching Music through Performance in Choir. Along with performing, Hope is a vocal and piano teacher and has taught from early childhood to the collegiate level and beyond throughout the tri-state area for 14 years. Along with private lessons, she has been an adjunct faculty member at Molloy College and Salem Community College, teaching private lessons and Music Appreciation. She currently has a full private studio and also teaches private lessons at Music and Arts where students perform two recitals a year and participate in a piano festival at TCNJ and NATS. Hope also teaches group and private lessons at Dance Stop Education and teaches general music and the drama program at The Laurel School of Princeton. Hope is a board member for the Piano Teachers Forum in central NJ where she is the Publicity Chair. Hope has also gives various Masterclasses in colleges, high schools and churches in NY/NJ and PA.
Request Lessons with Hope today!